Standard - £404.99 Only 4 left! Whether you’ve got a shiny degree from Yale or you just really love Bulldogs, this furry friend is bound to liven up any Halloween hotspot! Hands down, bulldogs are the most noble of all canines. They hold themselves on a level that all other dogs wish that they could be on. Plus, they have amazing little smushy faces with underbites that we just want to squeeze! But they are also some of the most loyal and tough pets you'll ever come across. You'll never want to challenge these pooches to any events if you can help it...that’s why Yale adopted them as its mascot (because let’s face it, if you had to choose to put your money on a raging bulldog or a pilgrim named “John” or a color--crimson--you’d pick the bulldog, right? Sorry, Harvard). 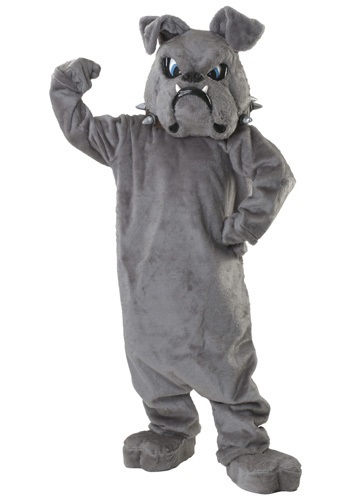 Anyway, whether your team is lucky enough to be called the bulldogs or you just want a Halloween costume that’s cute and cozy and looks like your pooch, you’ll roll over and play dead for this Bulldog Mascot Costume. It’s a fuzzy gray bodysuit with mitts and puppy foot spats, all guaranteed to keep off the chill during trick-or-treating or the trek to the big game or party. And just look at that bulldog mask! It looks ferocious. Bring a bit of pup-like pep to your next event and our money’s on you to win the hearts of everyone you meet.